The year is 2035 and there’s good news. Climate change has stabilised, greenhouse gas emissions are decreasing. There are no more superbugs resistant to antibiotics, and there hasn’t been an outbreak of an avian or swine flu for decades. And in 2035, the world is continuing to enjoy its meat. Only this meat isn’t harvested from the cadavers of billions of animals raised in abominable, disease-festering conditions. Rather, it is created solely from plants—and yet it tastes, smells, looks and behaves like the tissue of animals once so favoured by us humans. There’s plant milk and cheese, too. And the vast areas of global land that were once used for meat and dairy farming have been regenerated, with the natural flora sequestering carbon from the once-polluted air. In this 2035, no one is happier than Pat Brown—except perhaps the billions of animals that have escaped a brutal meat-farming fate—for it was Brown who had this utopian vision more than two decades earlier. Brown is one of the world’s top biochemists. After years spent working at Stanford University, where he made many scientific breakthroughs, he took a sabbatical. It might be one of the most productive sabbaticals ever taken, for it was during this 18 months “off” that he turned his mind to what he saw as being the most pressing issue of our times: climate change. A committed vegan, he observed how in the past 40 years the world has lost half of its biodiversity due to meat farming. The world can no longer sustain the volume and intensity of meat production without a resulting climate catastrophe. The animal-based food industry is the second-biggest contributor to environmental degradation and greenhouse gas emissions after the power industry. It is responsible for 15 per cent of global greenhouse gases, it uses one quarter of our freshwater and, shockingly, half of the Earth’s land is being used to raise animals or to grow the crops to feed them. Meanwhile, our unfettered desire for fish and seafood has decimated ocean populations. Something needs to be done urgently. On the day of writing this article, one of the top stories in the news is the “final call” proclamation by climate scientists that we are far from our greenhouse gas emissions targets and unless drastic and immediate action is taken, we will pass the point of no return. Brown also understands that, human nature being what it is, the vast majority of consumers will not give up meat out of some altruistic calling. Nor are governments likely to legislate against meat and dairy production. Brown’s eureka moment was that the only way to get people off their meat and dairy addictions was to use a market-driven approach: offer consumers better alternatives—better in taste, in nutrition and for the environment—and they will eschew traditional animal meat and dairy. The first product Brown tackled was ground beef, knowing that beef farming is the most environmentally degrading practice and that ground beef makes up half of meat consumption in the US. Brown, with his hand-picked team of world-class scientists, knew he could unravel what makes meat meaty and come up with a plant-derived alternative. So, in 2011, with his laptop in his backpack, Brown cycled across Silicon Valley to Khosla Ventures. The renowned venture capital firm saw how Brown’s idea could disrupt what will soon be a US$3 trillion industry and immediately gave him his seed funding. Impossible Foods was born. 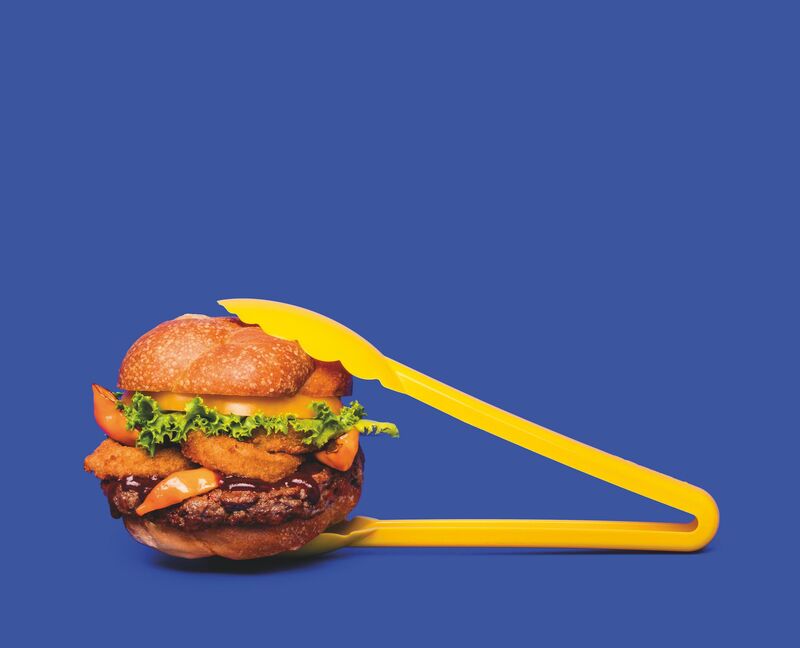 It didn’t take long for Bill Gates, Li Ka-shing (via his Horizon Ventures), Temasek (Singapore’s sovereign fund) and UBS to jump aboard—and, to date, Impossible Foods has raised US$400 million. In 2016, after five years of lab work resulting in some 50 patents, Impossible launched its ground beef at David Chang’s Momofuku Nishi in New York to great success. Chang, a champion of meat and castigator of vegans, became a convert. Impossible Burgers are now sold in more than 3,000 US restaurants. In April this year, the revolutionary product was launched in Hong Kong, with Impossible meat served at May Chow’s Little Bao and the Beef & Liberty restaurants. Hong Kong Tatler and the Grand Hyatt Hong Kong made history in September by holding the world’s first black-tie event to serve Impossible meat, a moment marked by Impossible on its Twitter feed. A pink, fleshy substance that sizzles like beef, Impossible is made from potatoes, wheat, coconut fat and a substance called heme. It only requires a quarter of the water and 5 per cent of the land required to make its animal counterpart. Impossible’s production facility in Oakland, California—a former plant for Just Desserts, which was taken over by Impossible last year—produces 500,000kg of meat per month, which equates to just 0.02 per cent of the ground beef consumed in the world. This points to a huge opportunity. Says Brown, “The first goal was to get animals out of the food system because that’s by far the most destructive technology, but we shouldn’t stop there. We should be thinking about how we can make this food system more robust, more secure, and lower the environmental footprint all the time. And it’s been completely neglected by science as an opportunity for innovation and discovery.